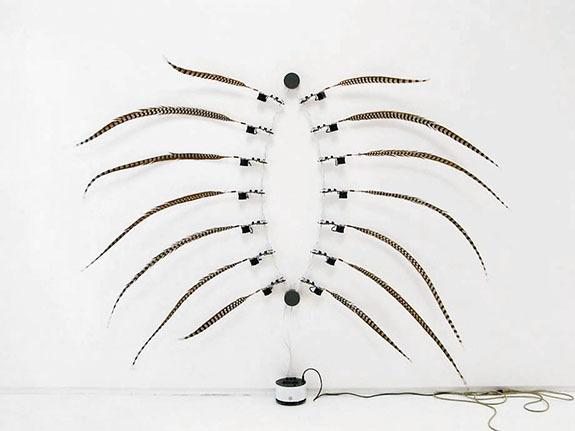 Creature II, 2012, aluminum, custom electronics, motor, feather, LCD, 25 x 13 x 44"
The first thing you’ll encounter upon entering Virtual Unreality, the first retrospective survey of Alan Rath’s electronic sculpture in two decades, is the sense of mechanical whimsy. Works included in the exhibition present an extraordinary—if concentrated—overview of the artist’s creative production between 1985 and 2018. Spread across two adjacent spaces, it eschews chronology in favor of thoughtful groupings that mix gesture, form and affect. 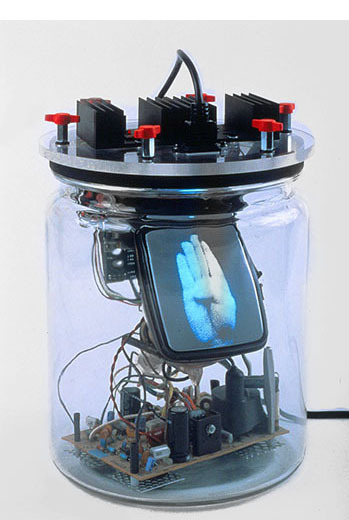 manifested in various forms: in the notion of anatomical digits, numerical digits and digital media forms. And as you explore further, the play of signs fluctuates between programs “running” and running figures, and notions of the self-aware automaton. 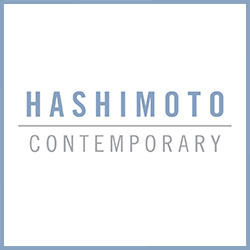 An established figure in kinetic and robotic sculpture, Rath’s works are held in numerous public collections and his work has been exhibited internationally. 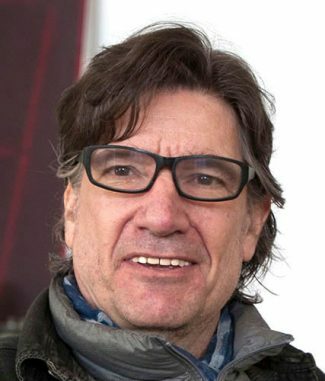 Born in 1959 in Cincinnati, Ohio, Rath earned his bachelor’s degree in science in electrical engineering from Massachusetts Institute of Technology (MIT) in 1982. 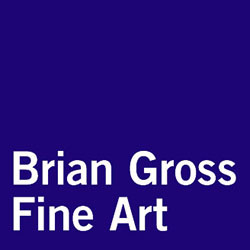 While there, he participated in the Visual Language Workshop, The Architecture Machine Group and the Center for Advanced Visual Studies, each of which influenced his thinking on the relationship between humans and their lively machines. 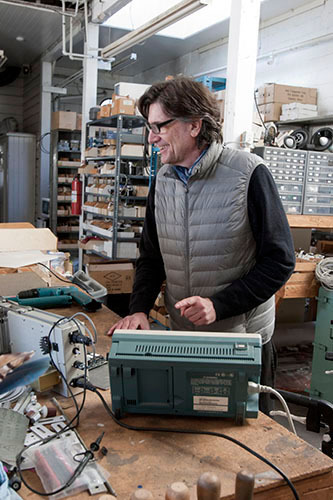 Rath relocated to Northern California in 1984, in pursuit of unfettered access to the electronic raw materials needed for his artistic investigations. Silicon Valley proved to be a good move. 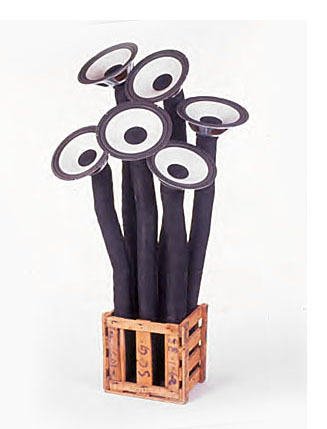 Introspective Sculpture (1988), a three-part piece stationed on a shelf, appears to slither. Its cathode ray tube (CRT), propped up on one end, flickers between images of a zero and one. Nearby, a birch-constructed frame housing an LCD screen displays a pixelated skeleton striding toward the viewer, followed by the image animation of a man sprinting in profile. Titled RM (2018), the work displays the “running man” of earlier pieces such as Run Run Run V (2008), which features a pink runner on a diminutive, vertical LCD screen presented in a bell jar. The most striking of these, however, is Running Man II (2002), in which a small screen containing Rath’s iconic animation, set in a black cylinder, rotates on an aluminum arm around an axis. It simultaneously recalls a clock, a tether, or the futility of a hamster wheel. works, Rath pays close attention to the interplay between the technological and the organic. 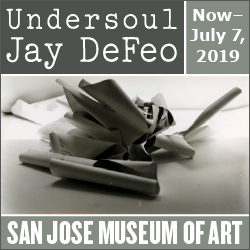 At one end of this continuum are the pared-down, ultra-sleek numerical counters; at the other are his most recent works: motion-activated robotic sculptures that mimic the behavior of living things. These differences may well reflect trends sweeping Silicon Valley. 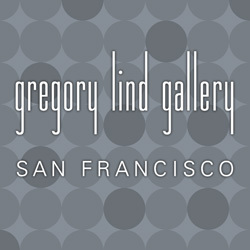 When Rath began making art in the early 1980s, the field was transitioning from the electrical to the computational, and the work exhibited here strongly mirrors this shift. It’s especially evident when you compare the relatively older works featuring analog CRT screens to the more recent digital LCD works. 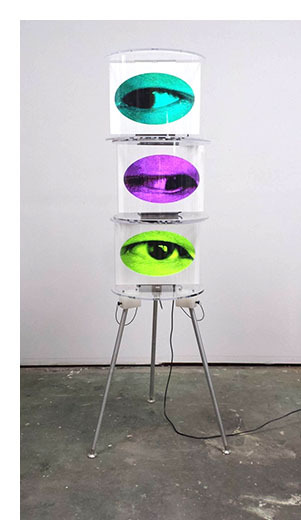 Cylinder V (2016), a totem-like vertical stack of three video eyes, and the jaunty Eyeris IX (2017), a sculptural arrangement of oval displays with blinking eyes, connected by chunky red wires to a red cylindrical base. Though constructed using LCD screens as opposed to CRTs, these newer pieces possess the same uncanny quality of interiority, and a spark of life. There’s also something retro-futuristic about this work, a quality achieved through the rigorous rejection of the cool, smooth, seamless aesthetics of consumer technology. 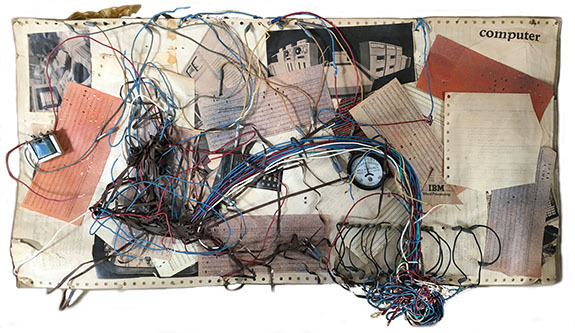 In Rath’s misfit toys, circuit boards, wires and the electronic components affixed to them are fully exposed, but never to a point where they descend into visual chaos. Some works contain motion sensors that react to bodily movements, but without exhibiting any larger intentions, they create a disconcerting tension that arises from the feeling of being sensed but not seen. Creature II (2012), for example, is a perky little work, about the size of a small dog. Resting on four legs, the aluminum-rod torso connects to a long neck and an LCD screen on one end, and a motorized feather on the other. 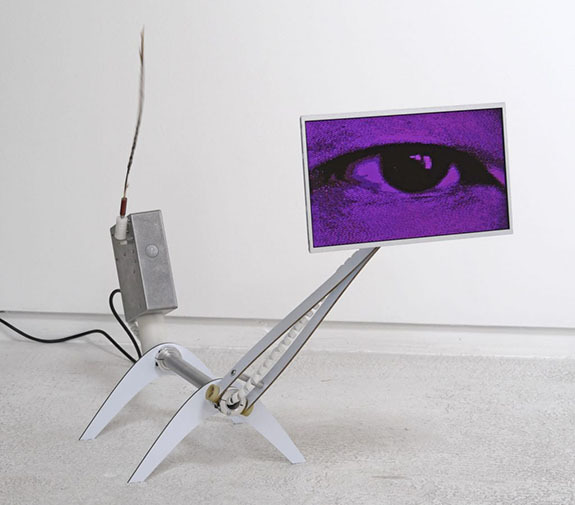 The purple screen displays a large single eye that turns itself toward the viewer, while its feather “tail” wags enthusiastically. It strikes a perfect balance between the feeling of a cheery welcome, and the thought that something’s not quite right with this uncanny little contraption. gestural mark making. This runs counter to the predominant trend of concealing power sources, wires and the mechanical devices. Instead, Rath draws it all to the fore, treating the industrial elements as assets. 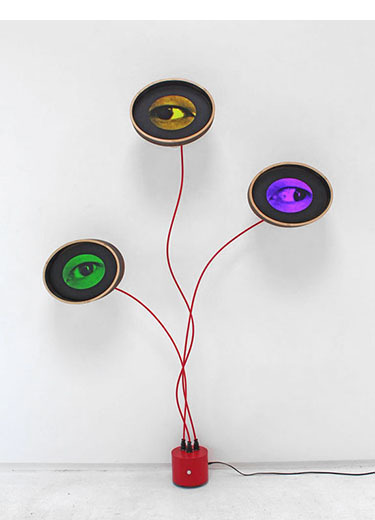 Each of the eight speakers pulsates gently, providing visible evidence of a sound that is otherwise imperceptible to the viewer. the wall, which perform a series of unrehearsed gestures. Custom built using birch plywood, glass-reinforced epoxy laminate, aluminum, steel, polyethylene, motors, and custom electronics, the two arms rotate along the wall, seeming to respond to each other, shimmying and dancing, occasionally almost touching. The gentle whirring sounds of their motors enhance the captivating effect. 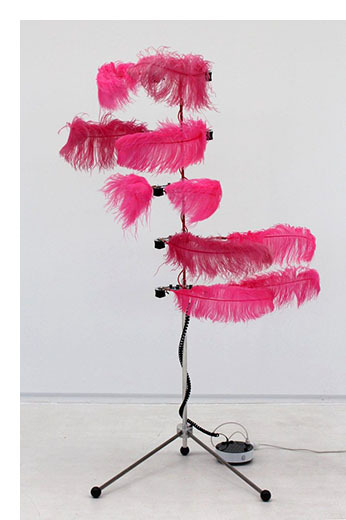 All three works mix playful mechanics and organic qualities, particularly the first two with their swaying/gyrating feathers. Rath’s work seems to speak less about present-day technology than about the sense of play and optimism that technology evinced in the past. The exposed electronics and cathode ray tubes evoke an anachronistic retro-future. But rather than operate as pure delivery devices for information as so much of today’s electronic media does, his works are resolutely sculptural. 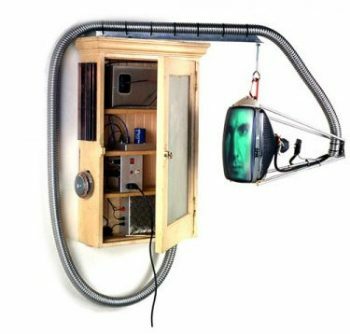 Like a cabinet of kinetic curiosities, Alan Rath’s Virtual Unreality presents an array of objects engineered for the contemplation of complicated technological times. 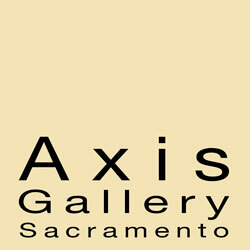 Alan Rath: “Virtual Unreality” @ San Jose Institute of Contemporary Art through June 9, 2019. Soraya Murray is an interdisciplinary scholar of contemporary visual culture, with particular interest in art, film, and video games. An Associate Professor in the Film + Digital Media Department at the University of California, Santa Cruz, her writings are published in Art Journal, Nka: Journal of Contemporary African Art, CTheory, Public Art Review, Third Text, Film Quarterly, PAJ: A Journal of Performance and Art and Critical Inquiry. Murray’s book, On Video Games: The Visual Politics of Race, Gender and Space (I.B. Tauris, 2018), considers video games from a visual culture perspective, examining how they are deeply entangled with contemporary political, cultural and economic conflicts. David M. Roth: Can you talk about your family, where you grew up and what experiences in your early years led you to the path you’re on today? Alan Rath: I grew up in suburban Cincinnati with my brother, sister, mom, and dad. It was the outer edge of suburbia, so just beyond our backyard were miles of woods that I used to explore as a little kid. I spent a lot of time bicycling along quiet roads in the area. My bicycles were some of the first machines I got to work on. My dad was a salesman and he was one of those people who really didn't do anything with his hands, but he did enjoy taking photos with his Leica and was quite good at it. My mom was an artist and she was very good with her hands. She sewed costumes for theater groups and she ran that out of our home. One of the more interesting things she did was to install walls and create rooms in our unfinished concrete basement. She did it all herself when I was about nine years old. She could imagine how to carve up that space and could do all the sawing and hammering, too. I ended up wiring a couple of light fixtures for the finished space. So you were already interested in electronics. When I was around 10 or eleven I was trying to build a circuit that was published in Popular Science. There was a schematic in the magazine for a strobe light. 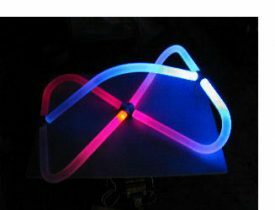 I was fascinated by flashing lights, and I wanted to build that circuit. But it was hard to buy parts back then, to get hold of transistors. Rath's first artwork, 1972, a collage of wires, electronics, magazine ads, punchcards, 12 x 18"
Actually, my dad took me to this industrial/commercial place that sold electronic stuff, and he took me there on a Saturday and I’d be up at the counter with my list and these nice people would get me the parts. Was this a precursor to the lighting system that you later built for a concert? I remember we spoke about that earlier. One of the things that got me interested in electronics were rock concerts that I’d been to with all the equipment for amplifying the sound and the lighting equipment. With a friend we did the lighting for an outdoor three- day rock concert out near where we lived, and that was when I was about 15. That was basically switches that could turn lights on and off; it wasn’t very complicated. You’ve talked about being influenced by music of the late ‘60s and early ‘70s. But I wonder how that worked. You couldn’t have been more than nine or ten years old. Exactly. In ‘69 I was nine years old. And it's only because of my older brother that I was exposed to all that great music. That's how I knew of The Who, Led Zeppelin, Pink Floyd and a lot of other great bands. Otherwise I was too young. A friend of mine had a big brother who saw Jimi Hendrix play at the Cincinnati Gardens. He showed us photos he had shot. We were too young to go. What else were you listening to? Emerson Lake and Palmer was the one of earliest bands that I heard that was using a synthesizer– [the song] Lucky Man in about 1970. There were other bands, too, like Yes and Genesis. I was fascinated by the idea of electronic circuitry making those sounds. A pivotal decision was going to MIT. What drew you there? I heard about MIT because friends of my family had a son who was four or five years older who ended up going there, and he was a quirky nerd kind of guy who did some interesting things — that's how I heard about the place. Did you see yourself on any particular career path? Not really. I started in the physics department and I quickly figured out that I would need to stick around to get a PhD to do anything, and I didn't feel like waiting that long, so while I was a freshman I switched over to electrical engineering. What did you envision yourself doing? I was really naïve. I wasn't thinking about what I would do as a job; I was just thinking that I wanted to learn better how to build circuits because that's what I had been trying to do when I was in high school and things kept on exploding and shorting out – it was a lot of trial and error. I had no idea of what engineers do. And it was while I was there that I started to see what the applications were for the technology, what people were doing with it. When I graduated in 1982, I saw that it was also commercially a very viable career at that time. Custom circuit boards designed and built by the artist. 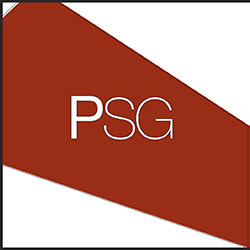 You enrolled in what was called the Visual Language Workshop, The Architecture Machine Group and the Center for Advanced Visual Studies. Can you describe, briefly, what were these programs were about? 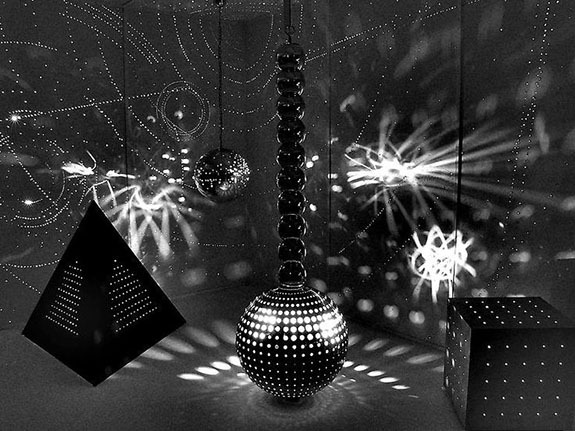 Otto Piene, creator of Light Ballet (above), was one of Rath's instructors at MIT. Synesthesia as in sensory blurring? Right. Sound into light. Pressure into light. Touch into light. I was using all these different means of input to control the lights, one sense going in, vision coming out. I know that Piene was involved in light sculpture. Light sculpture from Milton Komisar, Rath's employer when he relocated from Cambridge, Mass. to Oakland. a senior in college, and that is what brought me to the Bay Area because Milton is in Oakland. I continued building electronics for his work and I sometimes would fly out here with it, and that's when I got to see what kind of parts were available to buy in Silicon Valley and that's why I decided to move out here. That must have been a bonanza. The whole problem – and this is going back to the ‘80s – was that electronic parts were only sold wholesale; there was no way for individuals to buy that stuff. But in Silicon Valley where so many companies were going bankrupt, there was a retail market of surplus parts acquired from defunct companies. You could actually go into a store and buy chips, transistors and electronic gizmos that otherwise you would never be able to get. When I first encountered your work it involved small CRT screens that you fashioned into sculpture. It was immediately seen as radical, and it was. 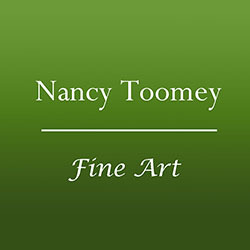 Did you have any difficulty getting the art world to accept what you were doing as art? It was split, but there were enough people who were really into it that allowed me to have shows, and then there were a bunch of people who seemed completely mystified by it and were adamant that it wasn't art, which I was kind of happy about because I was afraid that maybe I was too conservative because building objects by the ‘80s seemed passé. But I really like objects. I like to make things. I like working with my hands and I like a tangible product. So I really felt that was kind of out of sync with the times. computers were on their way to becoming household appliances — in that context your work may have tapped into some of the anxieties people were staring to feel about high-tech industries. Do you think that helped pave the way? It made me feel like the work that I was doing was fresh enough that a lot of people couldn’t get it. You’ve spoken of machinery as being “corrupted” by decoration. Can you explain what you meant by that? Certain industrial machines or custom high-tech stuff that I would see in the laboratories of MIT — they didn't have any product designers; it wasn't a commercial thing, so there was never any attention paid to aesthetics. And yet, because its purpose was so pure, the stuff looked gorgeous. My favorite example is the Apollo 11 moon lander. I always call it the most beautiful sculpture of the 20th century because there's no visual design to it. It is completely built for purpose under all the physical constraints of nature. Your art embraces that idea. It declares the aesthetic values of wires, exposed circuit boards and the like. Yeah, because I think that stuff is beautiful and there's no reason to cover it up. Truth to materials in other words. Steve Jobs probably would have disapproved. I don't know. There is a phrase I learned way back at the Visual Language Workshop called transparency of process. Meaning, how things go together should be apparent; it should be obvious. Where there any artists, authors or theorists – apart from those we’ve already discussed — who were influencing your thinking? I wasn’t looking at much art that was out there, but I was always interested in music. Music is always what propelled me. I was interested in the rock music of the late ‘60s early ‘70s which used a ton of electronic equipment to make it happen, and it was music that wouldn't exist without electronics. I like Jimi Hendrix because of that sound and also Pete Townsend of The Who. And then there's the whole structure thing about music, the way it exists within the framework of rules, and the rules are generative rather than restrictive. I just loved music but I could never do it. I’m so intrigued by the way it works. I don't know if we understand how it works, but it is somehow very powerful and a lot of people are affected by it and it seems to transcend culture and language — it can generate intense emotional states without words. It sounds as if you’re trying to harness music’s emotional power, translating it to the viewer through objects? I don't know so much about how it relates to the viewer. It’s more about the process that I use to build stuff and also the process of writing code. A lot of it has to do with structure and part of it has to do with this idea that musicians do not think about music note-by-note; they think about chords and keys and tempos. There has to be a structure that somewhat guides how the pieces fit together. I just think of that as guiding me in making a framework for the rules of how I can put things together. There are lot of things that are not allowed and there are things which do fit in this structure — but it's a structure about how to assemble things rather than how to sequence sound. 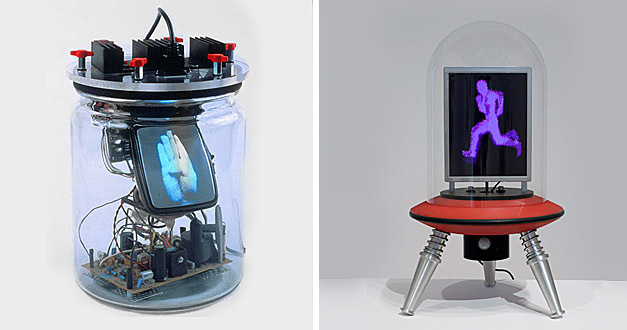 I’d like to hear your thoughts on the images displayed in your CRT sculptures: the shifty eyeballs and wagging tongues, hands signing and flapping lips. All these things deal with the most basic aspects of human communication. Why did you select that imagery? way the Industrial Revolution increased our strength: the next phase in expanding our sensitivity and ultimately our brainpower. But the imagery was all related to the sense organs and communication. Were you at all thinking about how the surrealists and the Dadaists used the eye? I’m thinking of George Bataille’s Story of the Eye and of Magritte and how he used it. Did any of that enter your thinking? No, I didn’t know about it. I was just interested in the sense organs of the body and a way of illustrating that. These sculptures carry opposing undercurrents. There’s the dark side, the side that’s about surveillance, about how technology is somehow imprisoning the human spirit, constraining us, watching us. Then there’s the humorous, the Dadaist absurdist side. How do you see it? It’s a double-edged thing. I was interested in the expanded capability that electronics would bring us. 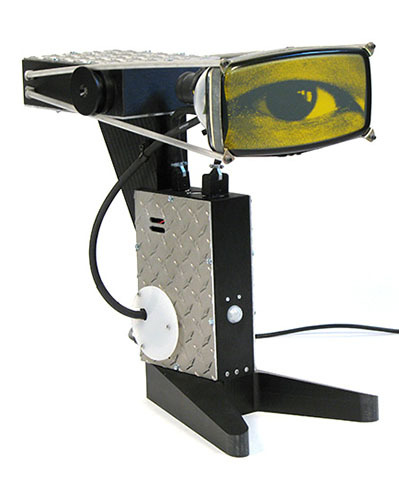 I know there is something unnerving about a machine that can see, and the eyeballs in my pieces were always meant as indicators that the machine was sentient (even if it wasn't), but it’s trying to represent a thinking machine. I just thought that's where we were going. That's what I saw when I was in college in the early 80s, that there was no longer this easy divide between humans and machines, that there was this new thing, the machine that was quasi-human starting to have awareness, and that's what I was trying to represent. No doubt you were aware that people were seeing in your work reflections of an emerging surveillance state. That was not really my intention, though, like I say there's a certain creepiness about a machine that can watch you. I wasn't thinking about the surveillance state, but I was thinking about the machines that are watching you. I didn't know exactly who's using these machines, but the fact is that there's going to be machines that are out there in the world watching what we do. I know you used yourself as a model for some of the images on the CRT screens. To what degree is your work autobiographical? Scanner VII, 2009, 19 x 10 x 19"
(laughing) because I don’t know that we have that much awareness of how our own life is in these pieces. It’s inevitably in there much more than I ever was consciously aware of. I would say there's only a couple where I was trying to talk about myself, but in the others I would have to say it's there even if I didn't intend it to be. You’ve spoken about the role of technology plays in human life, and how delusional it is to view ourselves as being separate from it. Quite obviously, everything around us is the product of some technological breakthrough. Yet most people seem to glide right past that. We believe on one hand that science is mankind’s friend and on the other that it’s robbing us of our humanity. And we seem to be able to hold those views simultaneously. You reject this kind of polarized thinking. Why? I have to credit the Ken Kenniston [at MIT] with starting me thinking about that situation long ago. The course of his that I took, which was in the Science Technology and Society program, was called something like “Technology and the Recovery of the Natural,” and it had to do with the hippies and the Luddites in various historical phases where people became alienated from technology. People seem to be alienated from so much of this stuff even though they're immersed in it. It seems like people are only freaked out by the stuff that has appeared since they were born. Everything that existed in the built world up to that point they totally accept. They do not think of clothing as being a technological product. They do not think of how much their shoes help them. They do not think about the immunizations they received as a kid. They don't think about their dental care. That’s all just accepted. It’s only the newest edge of things that freaks people out. 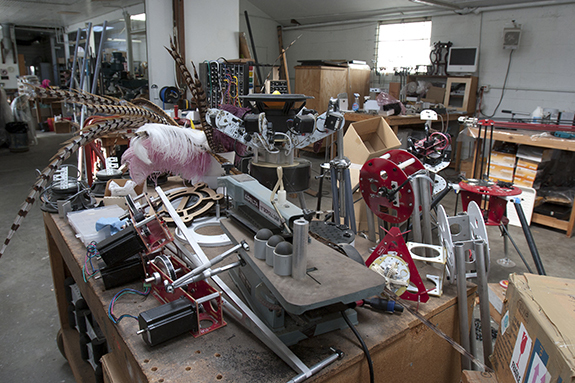 In the mid-1990s you began working on robotic sculptures, machines that execute human or animal-like movements. What prompted you to move in that direction? I always wanted to make things that move, but the fact is that it's really difficult — especially making something that's going to last. So that was a project I started the same time as the CRT pieces, but it took at least 10 years for me to figure out what tools and techniques I would need to make something that would not destroy itself but could actually keep running. The thing that I needed to learn was how to be a machinist. I have to thank Mark Pauline and his crew for letting me see how being a machinist is useful. That’s one aspect of building objects. When it comes to moving parts you need really tight tolerances. You need tools like a milling machine and a lathe to fabricate those kinds of parts. What about the programming aspect? Are you talking about the programming to animate these things? It’s not that difficult, really. The machinist part is more demanding than the programming part. 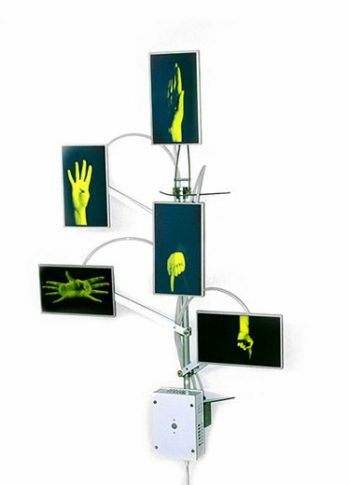 Are the robotic sculptures interactive? Do they respond to movement? They don't respond. They sleep when nobody's around and they wake up when we’re here. …was doing its thing. Now it’s sleeping. That’s so I can leave them plugged in all the time. They’re on all the time and they just wake up when people are here. It’s a motion sensor hooked up to the internal computer that's running things. That [choice] is both practical and important for me conceptually. The practical side is that it’s a machine whose life is limited by how much it moves, so I don't want it moving 24-hours-a-day. I want it to sleep when it doesn't have to do anything. Also, from an engineering sense, switching on the power is a huge jolt to any circuitry, so it's much better for the circuitry just to be on all the time. That makes sense. Preserve the machinery, and besides, why perform if there’s no audience? Yeah. Then there’s the conceptual part. 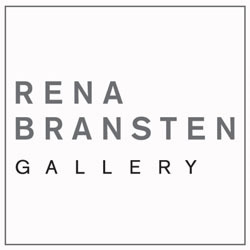 In the late ‘70s early ‘80s I had the experience of going into galleries that were showing video work and you'd come up to a TV on a pedestal and you had to get a gallery assistant to turn it on so that you could watch something; whereas the paintings were just hanging there, and it felt like paintings had this unfair advantage. And the machinery, likewise, has to always be there and it can't wait for somebody to turn it on, it just has to be there all the time. Plus with video, if you show up in the middle, you have to wait for it to cycle over again from the beginning. I wanted the imagery on my screens to be non-narrative, something you could enter at any point and didn't have to wait for a beginning or an end. That was something that intrigued me about certain kinds of [minimalist] music. I was very much impressed by Steve Reich and I believe that he was much influenced by gamelan. I don't like gamelan, but I like Steve Reich and I can totally see the connection. I like how he took something and transformed it. I was very much into that music. 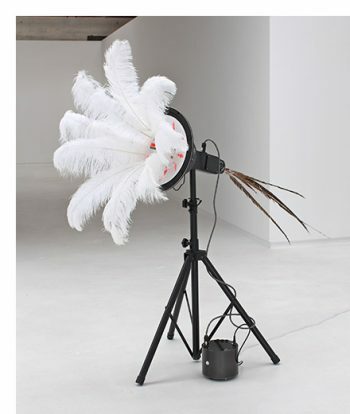 Forever, 2012, pheasant feathers, aluminum, polyethylene, fiberglass, electronics, motors, 90 x 60 x 12"
Did Rebecca Horn’s work influence your robotic feather sculptures? 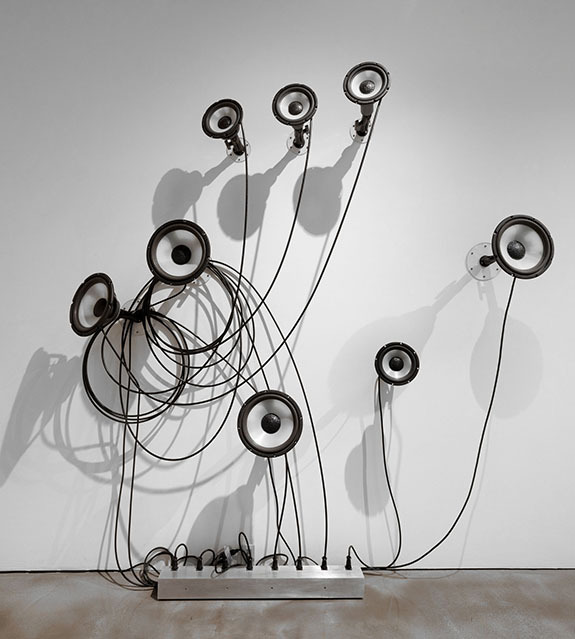 I have seen a few Rebecca Horn pieces, not in person, only in reproduction, but that's interesting – I hadn’t really made the connection. I’m not sure what she did with feathers. I know the process works where she was throwing ink on the wall. 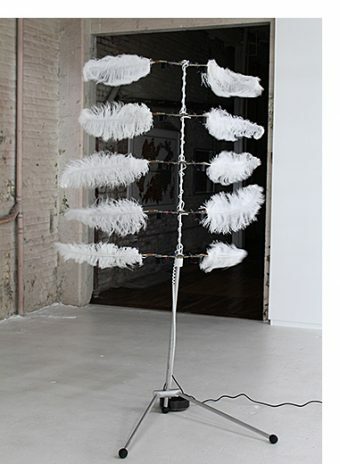 She made motorized sculptures that involved feathers that look very much like yours. I’m not sure how they behave because I haven’t seen them. I wonder if she arrived at feathers sort of the same way I did. Feathers are really interesting in terms of their physical properties. They’re super-lightweight super-strong and they’re flexible. They’re incredibly sensual. The most common observation about yours is that the movement resembles mating dances, but I sense your inquiry had more to do with solving a particular problem that imitating nature. mistake in my program it would slam into something and I didn't want to break it or break the machine. So that's how it started. Then the feathers just got bigger, and as they got bigger I saw how they could bend. And it was that bending that created these curves. Because in my work mostly I use metal forms as cylinders and rectangles, and I use wires as curves, and this was a way to get these dynamic curves — these constantly changing curves, these drawing-in-space curves. There’s one part of your work that I’ve never understood, and that’s the Counters. However, I did come across what may be a meaningful clue. In the catalog essay for your show at Site Santa Fe I read that on some of the circuit boards in these pieces you inscribed a quote from Lewis Mumford. It reads: “In time keeping, in trading, in fighting, men counted numbers, and finally, as the habit grew, only numbers counted.” I can think of a number of ways to look at that. What do you take from it? I have a lot of different feelings about numbers and math, and I guess the one thing related to that quote has to do with how often news articles announce the creation of $4 million department of this or that. A huge effort is reduced to a single number. I just use numbers to do what I'm doing and I feel very comfortable doing it, but it's sort of like technology: I see how a lot of people are alienated from numbers that don't mean anything to them. Yes, but what does all this counting mean? the way up to a million again in a 24-hour cycle. It’s taking the day and dividing it into a million equal parts: a decimal time system which is actually relevant now in that we can actually divide the day into a million parts and time-stamp our emails with it. Think of a few hundred years ago what time was: before noon or afternoon or after dark. Harrison (1693-1776). Have you seen those things? They’re in the Royal Greenwich Observatory. 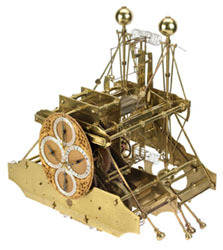 He was a self-taught clockmaker who made these incredibly accurate clocks. 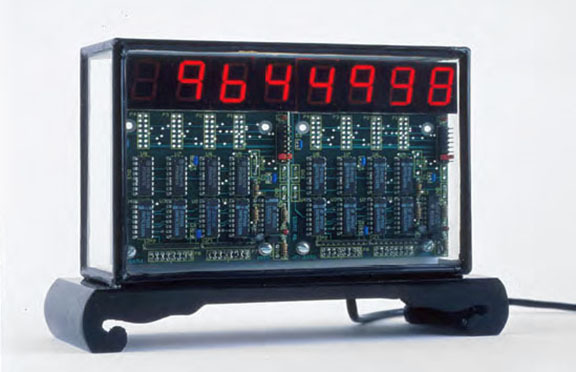 There are other Counter works of mine related to Pi where they just display digits based on certain historical computations of Pi by people who crunched it out by hand. You can trace our mathematical sophistication by how many digits of Pi exist at any given time. So if you go back 2,000 years it’s 3.14; now it's billions of digits because people figured out better methods and better machines for doing that. Pi just one of those totally surreal things; it’s a transcendental number. Some of my favorite pieces of yours are those that involve loudspeakers. They really do seem to bridge the gap between inanimate objects and living things. How did these develop? They seem to merge plant, animal and audio gear. Well, I want to throw all those things together: What is a plant? What is an animal? What is a machine? What is a human? How is it we decide what’s what? Because we’re going to have all these machines coming which are going challenge all of our categories. Are there any artists today with whom you feel a strong kinship? When I moved out here and started building things there were a few artists I was moved by, particularly David Smith. You’ve also mentioned Jean Tinguely. Yeah. 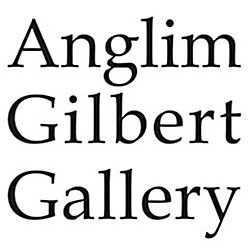 I saw a big show of his at the Tate in London (1982) and right after that I quit my job and moved out here (laughing). Also at Tate was a show of Harold Cohen (1928-2016). He’s the guy who wrote the big computer program that can draw, and he was there in the gallery with a giant flatbed plotter that he had built and it was drawing. It was a thrill to talk with him about his ideas. Are there any big ideas in circulation today or books you’re reading that are influencing your thinking, helping you move your work forward? I’m still learning the skills I need to build the kinds of things I imagined as a kid. I never knew it would take so long.